Starting in 1970 (I remember the date as it was the year I got married) I started making old-fashioned Christmas puddings exactly to my mother-in-law’s recipe, who made them from her mother’s recipe. I made them every September – not for the Christmas coming BUT for the following Christmas. She gave me my first one so each year from then on, I made puddings for the following year. I never had one go mouldy or stale, and sometimes they lasted two or three years if I had made quite a few. They were always dark, rich and delicious, but of course, full of sugar and suet. This year I read many recipes to try and find a gluten-free, healthier version to make for Christmas Day, but I wanted one that tasted really good. With so many ideas and recipes to choose from, I eventually decided to go with one which I had found from GoodtoKnow Woman’s Weekly which, although different, looked like it would be very tasty and moist. Mixing up all the fruit, spices and alcohol and leaving to steep overnight, had my kitchen smelling deliciously of past times and I was quite excited to see (and taste) the finished pudding. The recipe suggested using a 1.2L glass bowl but I decided to make a 1L pudding as well as a smaller one to have a trial run before the big day. I wasn’t disappointed !! 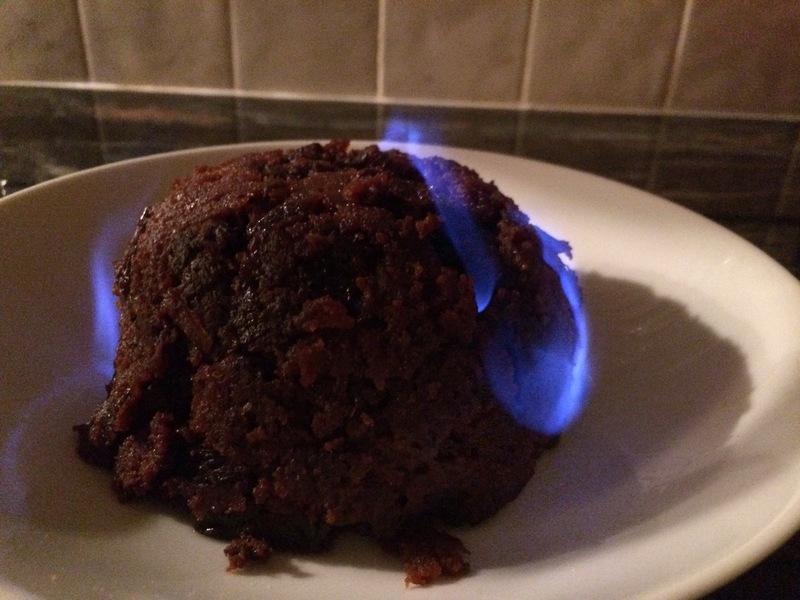 I flamed the little pudding (just managed to catch a picture of it flaming) and there was sufficient for two good helpings for my husband and I to try out. We both loved the pudding – it was deliciously moist and full of fruity flavour. 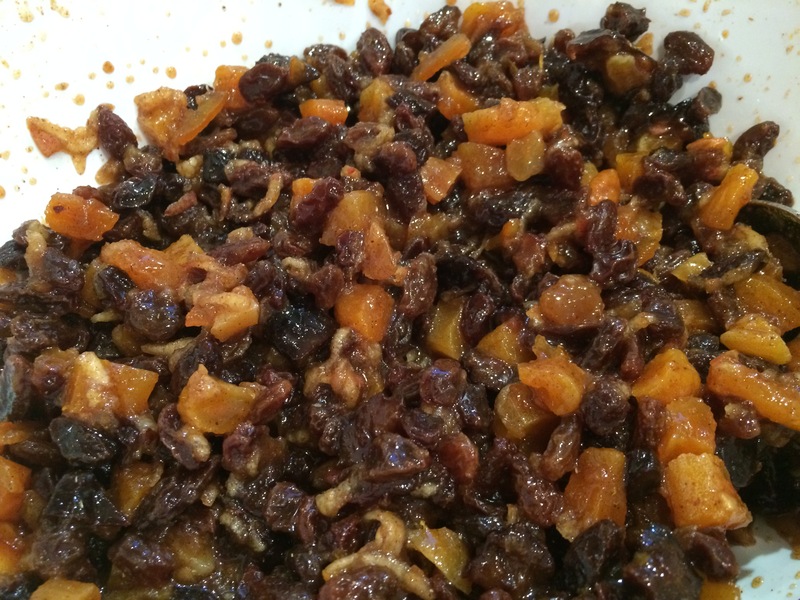 Cut the apricots and prunes into small pieces (scissors are easiest) and place in a large bowl along with the raisins and sultanas. Add the orange zest and juice. Grate the unpeeled apple (coarse side of grater) into the bowl, working around the core. Stir in the spices, marmalade, sherry and brandy. Mix really well, cover and leave overnight in a cool place (not the fridge). Stir in the butter, eggs, flaked and ground almonds and breadcrumbs. Mix well together. Spoon into a 1.2L glass bowl (I used a 1L bowl plus a smaller one) which has been greased well. A small circle of baking parchment in the bottom ensures it will turn out easily. Cover with pleated baking parchment, and then pleated foil. Tie securely with string. Either place in a steamer, or boil in a saucepan with a tight-fitting lid for 5 to 6 hours. If using a saucepan, either put an old saucer or jar lid in the bottom of the pan to sit the bowl on. 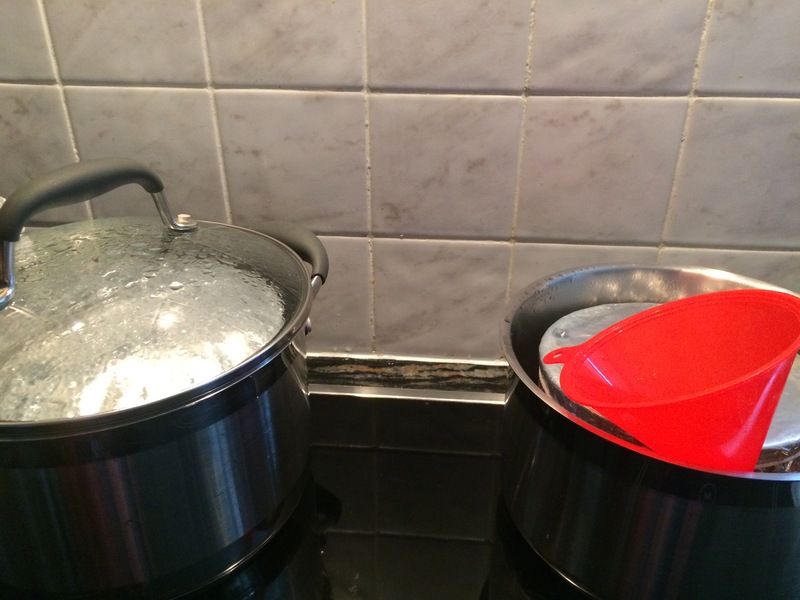 Make sure you keep topping up with boiling water so that it doesn’t boil dry. I find using a funnel for topping up with boiling water is much easier than trying to aim the kettle straight into the side of the pan. After five or six hours, take the basin out of the water and leave to cool completely. Remove the paper and foil and replace with clean. This pudding will store for up to three months in a cool place. To reheat: pop back into a steamer or saucepan and steam as before for 2 hours. Leave to cool down for about 20 minutes before turning out and serving with your choice of whipped coconut cream, full cream or custard. Pour a little heated brandy on top and set light just before serving for the full Christmas effect. 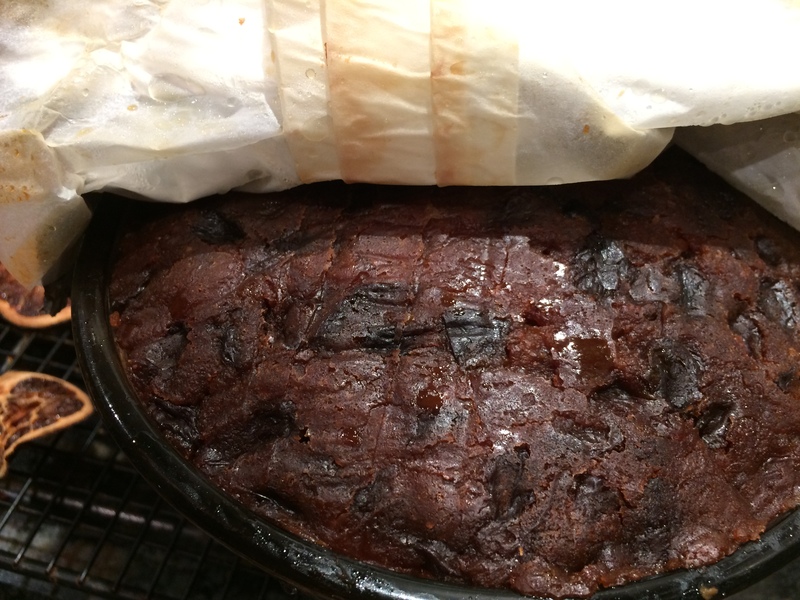 This entry was posted in Miscellany, Sweets and Treats, Vegetarian and tagged apricots, Brandy, Christmas Pudding, Gluten Free, Healthy Eating, Prunes, Raisins, Sherry, Sultanas, Vegetarian, Wheat-Free. Bookmark the permalink.